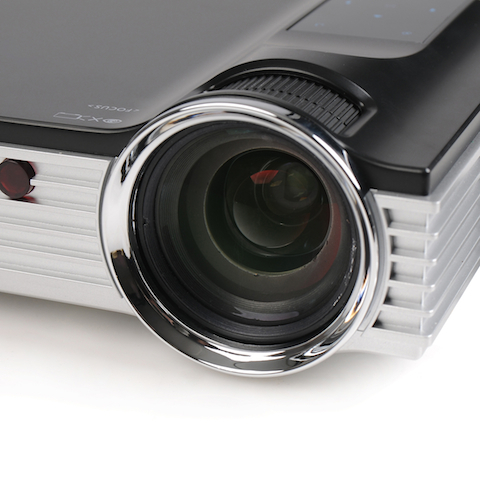 The Dreamy Cinema is a powerful 1,600 lumens LED projector with numerous audio/video inputs. It supports Full-HD movies with stereo sound and can natively read multimedia files from USB devices or TF/MicroSD cards. Due to the outstanding 1,600 lumens output and 2 x 4 watt loudspeakers, the Dreamy Cinema can turn a living room into a thrilling 4 metre wide cinema. 2x HDMI, DLP-Link 3D compatible. 1x Composite Video (RCA to AV input jack). Thanks to its native 1280×800 (16:10) resolution, the Dreamy Cinema handles the most recent formats available, including Full-HD Blu-ray movies at 1080p24Hz/60Hz. Additionally, the exceptional longevity of solid state LEDs ensures 30,000 hours of uninterrupted projection. A 1,600 ANSI Lumens light source emitted by 3 color LEDs power the Dreamy Cinema. This means that the Dreamy Cinema is enough to project a screen as big as 4m wide, 186″ diagonal. You can use one of the two-multimedia inputs to connect the Dreamy to an external disk drive, an USB key or a MicroSD/TF card and have access to hours of audio/video content. The Dreamy Cinema can read and display the most current audio video formats available such as avi, mkv, mp4, mp3, etc. This unit is available in the new “Velvet Black” finish, a matte black. The Dreamy Cinema can be placed at the bottom or at the top of the projected picture. It can be used on the top of a table as a polyvalent and nomad projector or fixed to the ceiling in a permanent install. Emission Method – Darkchip 3 DLP. Display Panel Size – 0.45” Darkchip 3. Projection Lens – Fixed Zoom, throw ratio 1:45:1. 1.3x Zoom throw ratio of 1.07:1 to 1.39:1. Manual focus. Brightness – 1,600 ANSI Lumens. Light Source, Life Time – LED illumination system estimated 30,000. Screen Size – 10” to 200” (Aspect Ratio 16:10). Distance Range – From 50cm to 500cm. Inputs – Composite Video, VGA Computer HDMI 1.4 x 2. 3D Compatibility – The projector users DLP-Link 3D synchronization. It can display video sources that are encoded in Frame Packing, Side by Side and Top and Bottom. Optional 3D glasses available. Outputs – Loudspeakers 8 watts Stereo (2×4 watt speakers). Stereo Jack 3.5mm jack can be used as: Stereo analogue output (3.5mm jack to 2x RCA cable) 5.1 /7.1 digital output (3.5mm jack to single RCA cable). Multimedia Slots – MicroSD (TF) card slot. 16GB up to 32GB. USB port. USB key. HDD drive. Power Requirements – 100V – 240V AC, 50Hz/60Hz. Power Consumption – <70W at maximum brightness. <1W in Standby mode. Dimensions – 275W x 170D x50 H mm. 10.8” x 6.7” x 2.0”. Net weight – 1.4 kg. Operation Environment – Temperature 5°C to 35°C (Storage Temperature 10°C to 60°C). Humidity 20% to 80% without condensation. 3D Glasses available at extra cost. Dreamy Cinema HD Projector -AUD$ – No longer available.